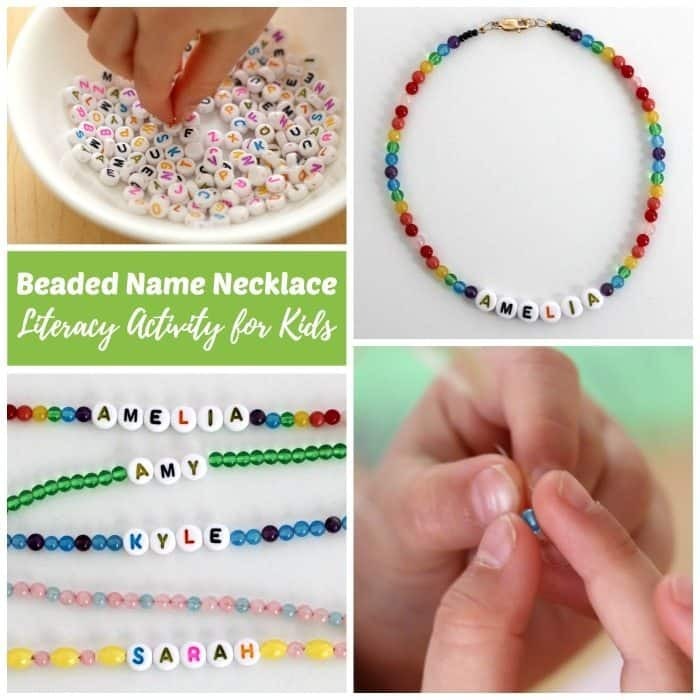 Making a DIY beaded name necklace is a fun literacy activity for young children. Older children and teens that already know how to read can have fun learning to make their own personalized jewelry. Personalized name necklaces make a great gift idea for friends and family. You can also try this mom necklace gift idea or make a mother-daughter necklace gift set! Have your child learn to recognize and spell their name while making beautiful jewelry they can wear! Learning to recognize, spell, and write their name is one of the first things a young child learning to read and write can do to start learning the alphabet. This activity will also help children strengthen the fine motor muscles of the hand in preparation for writing. It is a perfect literacy activity for young children. You can also have your child make a mom necklace while they are at it, or a mother-daughter necklace or bracelet set! One of the first steps to literacy is name learning. A child learns their name in three steps or stages; recognition, spelling, and writing. Making this necklace will help your child learn to recognize the letters in their name and learn to spell it. 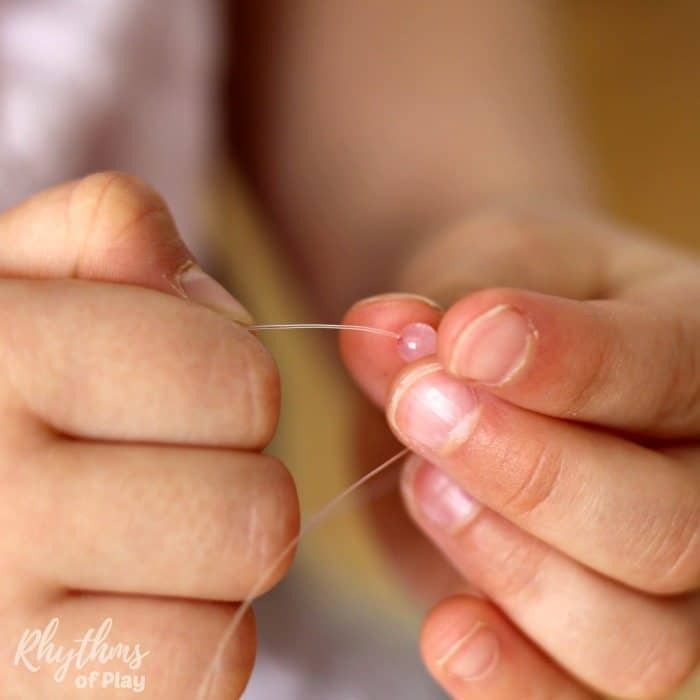 Stringing beads is also a great way for kids to practice fine motor skills and develop the fine motor muscles in the hand. Fine motor activities like this are great for preparing little hands to write. Creating patterns, reciting the alphabet as they work, and counting out beads will create even more learning opportunities. The bonus of this name recognition and literacy activity is that your child will have a necklace they can wear to continue to learn their name. My daughter loves to wear hers so she can correct the adults around her when they mishear her name by showing them her necklace. It’s easy to misunderstand a young child telling you their name. This makes it easier for everyone! There are three simple ways to start and finish a necklace for this project. Infinity, using crimp beads and pliers, or clamshell knot covers. Click on the link for all three tutorials. The materials listed below are also listed with the tutorials. We used 8mm round gemstone beads for this project because they look the best with the alphabet beads we used. 8mm Faceted beads would work just as easily. 10mm round gemstone beads or the plastic pony bead options listed in the section below may be better for your child if they have never strung beads before. These multi-colored lava-rock gemstone beads come in multiple sizes including 8mm and 10mm as another option. There are a lot more options you can use besides the 8mm round gemstones than I have listed below. Most of these links have more than one gemstone option available. Click through to see them all. If your child has never strung beads before it may be easier for them to use pony beads for their necklace. You can always make another one with gemstones once they have practiced a few times with pony beads. Stringing pony beads onto pipe cleaners is another fun way to practice strengthening the hand for more detailed work. 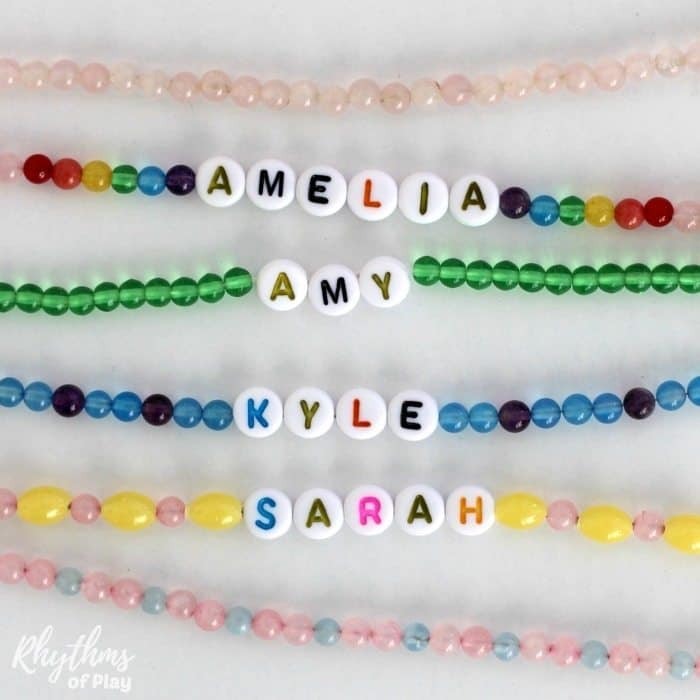 Have your child make a few pipe cleaner name bracelets with pony beads before trying a necklace. Young children will need help starting and finishing their name recognition necklace. As mentioned above, there are three simple ways to start and finish a beaded necklace. Click on the link to find all three easy to follow tutorials. When your child is finished with their name necklace, have them make a mom necklace or a mother-daughter necklace or bracelet set! Place the alphabet beads into a bowl or another container. Allow your child to take their time searching for the letters in their name and spelling it out. If your children need help with this, write their name in capital letters on a separate sheet of paper and have them find all of the letters on the paper. Help your child start their name recognition necklace using one of THESE methods. If you will be using pony beads you will need to use the “infinity” method. Decide how long you would like the necklace to be. If you are using more than one type of bead (or color of bead) you will need to decide on the pattern that you will string. Placing beads in patterns on a bead board makes it easy to test ideas. Help your child string the alphabet beads that spell their name onto the necklace when you are about halfway finished with it. For example, If you are making a 12-inch necklace, string their name onto the necklace when it is about 5.5 to 6 inches long. Once again, using a bead board makes this easy. Most kids will need help with making sure the letters of their name are strung so they can be read correctly. This is another great early literacy activity. “Does any letter come after it? Make sure your child strings the same pattern or number of beads that you placed on the other side of their name and you’re good to go. Complete the necklace using the same method you started with. Tutorials can be found HERE. Allow this activity to act as a springboard to learning to recognize the letters in their name. Since doing this activity my daughter spots print everywhere calling out the letters in her name. “E” is in my name, “H” is in my name, and on and on it goes. 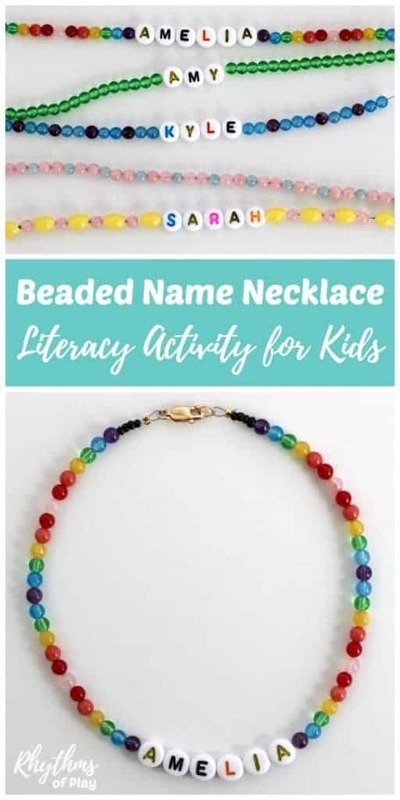 Making a DIY beaded name necklace is a fun literacy activity for kids. Have your child learn to recognize and spell their name while making beautiful jewelry they can wear! 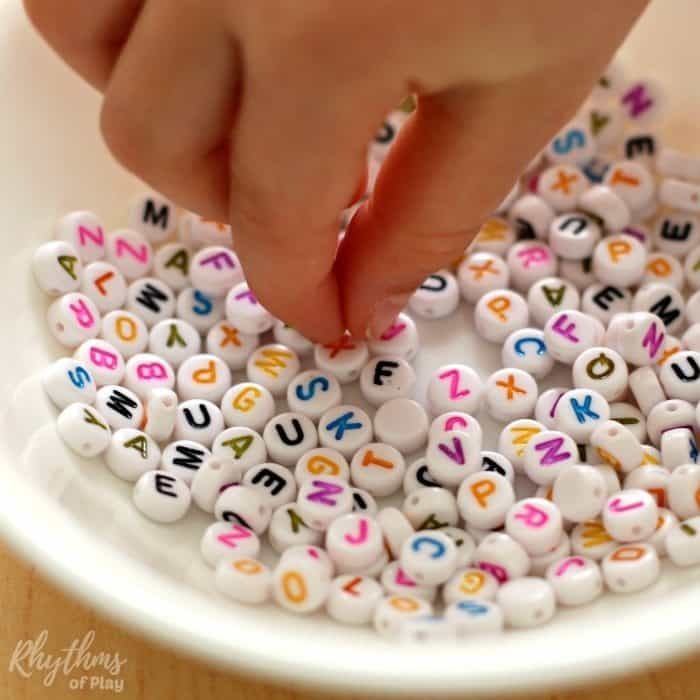 You may also like learning how to make an alphabet necklace, acorn marble necklaces, wooden bead bracelets, a mom necklace or a mother-daughter necklace or bracelet set! Be sure you pop over to have a look at our Kids Activities page for more fun ideas! Learn more about Rhythms of Play HERE! this is so cool for the children and useful too! Thank you! I agree 🙂 making them helped my daughter learn how to spell her name.